Campaign for the American Reader: Pg. 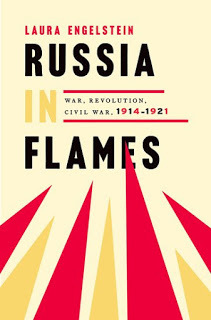 99: Laura Engelstein's "Russia in Flames"
Featured at the Page 99 Test: Russia in Flames: War, Revolution, Civil War, 1914-1921 by Laura Engelstein. October 1917, heralded as the culmination of the Russian Revolution, remains a defining moment in world history. Even a hundred years after the events that led to the emergence of the world's first self-proclaimed socialist state, debate continues over whether, as historian E. H. Carr put it decades ago, these earth-shaking days were a "landmark in the emancipation of mankind from past oppression" or "a crime and a disaster." Some things are clear. After the implosion of the three-hundred-year-old Romanov dynasty as a result of the First World War, Russia was in crisis-one interim government replaced another in the vacuum left by imperial collapse. In this monumental and sweeping new account, Laura Engelstein delves into the seven years of chaos surrounding 1917 --the war, the revolutionary upheaval, and the civil strife it provoked. These were years of breakdown and brutal violence on all sides, punctuated by the decisive turning points of February and October. As Engelstein proves definitively, the struggle for power engaged not only civil society and party leaders, but the broad masses of the population and every corner of the far-reaching empire, well beyond Moscow and Petrograd. The Page 99 Test: Russia in Flames.